The idea of adding new countries to the World Showcase at Epcot is a constant topic on Disney fan sites. When Epcot opened, Disney planned to add three additional countries, Spain, Israel, and Equatorial Africa, to the World Showcase. However, these were never built. In the 80’s, Morocco and Norway were added to the World Showcase. Currently, there are four or five available spaces in the World Showcase as one space is large enough that it could possibly hold two countries. 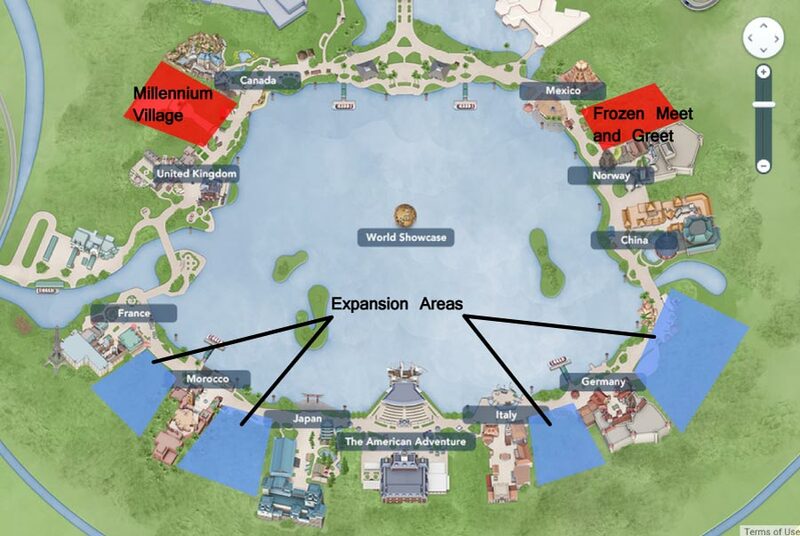 There used to be more spaces but the Frozen meet and greet and the Millennium Village took over two plots which in the future could become something else. During D23 there was some talk about the next iteration of Epcot and discussions about the topic picked up once more. While we do not know if any new countries will be added, here are my thoughts regarding some strong candidates that would be welcome additions to the World Showcase. South America – Brazil, Argentina, or Chile. Each of these countries offers both a rich and unique cultural perspective. They also have unique and varied ecosystems that could be explored. I would actually lean towards the inclusion of Chile or Argentina since I would love to have an experience touching on Inca culture. The mountainous regions and the Ring of Fire are also very tempting targets for attractions. While Brazil does have a fantastic culture, I almost feel it would make a better addition over at Animal Kingdom with an attraction focusing on the Amazon River, the rain forests with the surrounding area showcasing the culture and cities of Brazil. Australia – A whole continent covered by one country. Because the culture is heavily influenced by British imperialism, I would love to concentrate on the history and nature of Australia. New Zealand would also be a wonderful country to represent this region. Asia – China and Japan are already represented in the World Showcase. Some other options include Thailand and Korea. I feel that, despite their vast differences, they may not be differentiated enough to the American palette. Similarly, I think Russia has a very European feel to it. As such, my choice for a new country to introduce from Asia is India. India is country with plenty of qualities that would be wonderful to showcase through attractions, shows and food. Middle East – I feel that out of Middle East countries, Turkey or Egypt would be the best choices. Sadly due to the state of world politics any choice of a middle eastern country would probably start an uproar from Americans. Of all the choices out there, Turkey and Egypt have the best chance to avoid this problem. Luckily both countries present great opportunities. Turkey, being a cross road, shares elements with many different cultures. It contains an amazing assortment of ancient Greek and Roman ruins. As for Egypt you just have to say its name and people automatically think of its long cultural history. Africa – Africa is a tricky one for me to make a decision on. Northern/Saharan Africa is represented by Morocco, which I really think in one of the best pavilions in Epcot. Elsewhere on Disney property Animal Kingdom and AK Lodge do a nice job of highlighting parts of east central Africa. While they are concentrated on wildlife and nature, a lot of cultural elements are also represented. I wouldn’t choose South Africa due to it’s colonial past. Africa has 54 countries in it and I must admit I haven’t done enough research to really know which ones I would most like to see represented. In the future when I layout my concepts for a renewed Epcot I will share some more detailed ideas for these pavilions. Excited to see your thoughts on a renewed Epcot! I have many ideas as well!